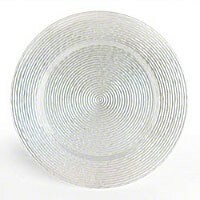 ChargeIt by Jay Circus Glass Charger Plate 13"
Home > Products > ChargeIt by Jay Circus Glass Charger Plate 13"
Perfect for wedding receptions and other formal affairs, the ChargeIt by Jay Circus Glass Charger Plate 13" adds a simple yet timeless charm to any table setting. Boasting a pristine white finish with silver, glittery accents, this product has a textured look that coordinates well with other dinnerware pieces. Thanks to its solid glass construction, this high quality charger boasts superior craftsmanship and unbeatable durability. Perfectly sized, this stylish piece beautifully frames dinnerware and provides protection against spills and mess that might otherwise stain your tablecloth. To clean and maintain this charger plate, hand washing is recommended.